What Is A Black Madonna? 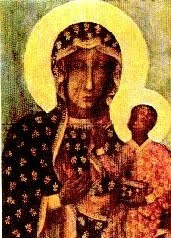 The Black Madonna is a painting of the Madonna and Christ Child which legend states was painted by St. Luke the Evangelist. St. Luke is believed to have used a table top from a table built by the carpenter Jesus. It was while Luke was painting Mary that she told him about the events in the life of Jesus that he eventually used in his gospel. The legendary history becomes better documented with the painting's ownership by Prince Ladislaus. In 1382 invading Tartars attacked the Prince's fortress at Belz. In this attack one of the Tartar arrows hit the painting and lodged in the throat of the Madonna. The Prince, fearing that he and the famous painting might fall to the Tartars, fled in the night finally stopping in the town of Czestochowa, where the painting was installed in a small church. The Prince subsequently had a Pauline monastery and church built to ensure the painting's safety. In 1430, the Hussites overran the monastery and attempted to take the portrait. One of the looters twice struck the painting with his sword but before he could strike another blow he fell to the floor writhing in agony and died. Both the sword cuts and the arrow wound are still visible in the painting. Later, in 1655, Poland was almost entirely overrun by the forces of Sweden's King Charles X. Only the area around the monastery remained unconquered. Somehow, the monks of the monastery successfully defended the portrait against a forty day siege and eventually all of Poland was able to drive out the invaders. ᗩᖇᒪᙓﬡᙓ ᒎᗩﬡᙓ ℱᖇᗩᙢᙓ. Simple theme. Theme images by luoman. Powered by Blogger.